DIVE-LOGGING IS A BIT OF A divisive subject in the diving community. While some diligently fill in a logbook at every surface interval, others take pride in having “so many dives” that they don’t bother logging them anymore. I would argue, however, that, in some form or another, we all log our dives, whether it be as an amusing anecdote to tell in the pub, a memorable marine-life encounter, a cherished photo, or an artistic depiction of the dive-site. Increased access to technology means that pretty much everyone today has either a smart phone or tablet, and with a wealth of apps available, dive-logging should be easier than ever. 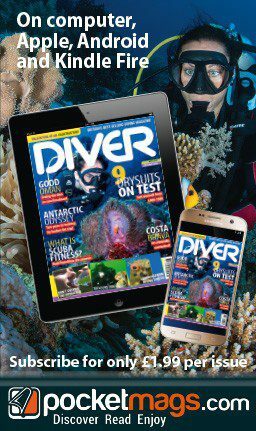 Here at DIVER we decided it was high time to test out the best dive-logging apps out there. How well does the app function as a logbook? Which features are included, and how much information can you record? Is the app easy to use, or am I left bashing the screen in frustration? How does the app look and feel to use? Is it a slick piece of technology with mouth-watering visuals? How does the price match up with the offering? Perhaps the biggest selling-point of a digital logbook is the ability to upload all the information directly from your dive-computer. With the latest generation of computers, equipped with Low Energy Bluetooth functionality, this can often be done via Bluetooth. For less advanced computers, it can usually be achieved via specialised USB dongles. The thought of losing all your preciously recorded dives is terrifying and, for many, a paper logbook just feels more secure than a digital file. How does the app address this issue? Does it provide the option of backing up your logbook and the option of moving them to other formats if necessary? This review covers apps for use with phones and tablets but not desktop-only. The idea is to uncover apps that can easily be used on a dive-boat, and phones and tablets are a more likely option in this situation. I used iOS devices to test the apps. Where possible I looked at those that can be used across several platforms but, as a starting point, each app reviewed is available at least in the Apple app store. The idea was to cover apps relevant to the widest possible community of divers and, as such, to ignore those designed solely for a particular brand or model of dive-computer. Comprehensive data-inputting options, including technical diving friendly features such as CNS tracking and the ability to add multiple cylinders and gases. Easy upload from dive computer and allows you to select exactly which dives to download. Use the Google Maps functionality to find and plot the exact location of your dive site. Using the data on your DC, it generates a beautiful graph plotting the dive which you can double click on for a more detailed view. You can’t add photos to individual dive-logs, only to trips or locations. No in-built fish-identification feature to help you find the marine-life from the dive. Most expensive app reviewed, and with an extra charge to pair your dive-computer. The design is a little plain – an inspiring underwater photo or two would be nice. Dive-Computer Upload: Yes, but as an in-app purchase (£2.99 for my Shearwater computer). 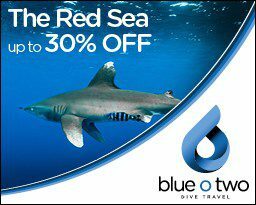 Multiple dive-computer brands are available as individual purchases. Back-Ups: Yes, excellent back-up functionality. You can also synchronise your logbook across multiple devices. 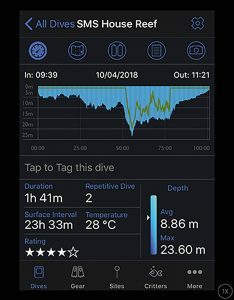 An excellent dive-logging app that is a pleasure to use. 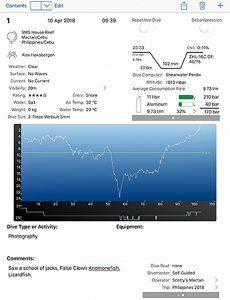 It is best suited to data-hungry recreational divers, and is the best app to satisfy the needs of technical divers. 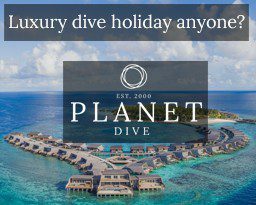 The price is relatively high, but fair if we consider that it could serve as your log for a lifetime of diving. 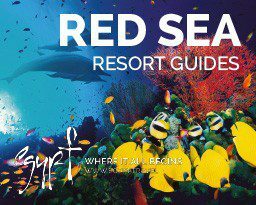 Easy to use, with a broad spectrum of dive information covered – everything from SAC rate to dive-gear used. Use the Google Maps functionality to find and plot the exact location of your dive-site. The app looks good and is clearly laid out. 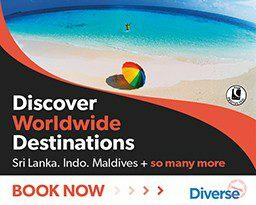 Upload your dives directly from a number of dive-computers, at no extra charge. 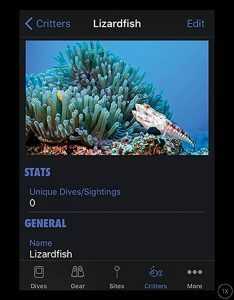 You can add photos and critters to individual dives to track what you saw and where. When syncing with your dive-computer, it automatically downloads all the dives – I would like the ability to select specific dives to upload. You can add multiple overlays to the dive graph, such as NDT or temperature, but the values of these parameters are not displayed anywhere, meaning that the feature is wasted. In an ideal world, it would be nice to have an in-built fish-ID database rather than have to manually input details and photos for each critter. A few inspiring underwater images would not go amiss. Dive-Computer Upload: Yes – free functionality which covers a large number of dive-computer models and brands.